The American Public Works Association convened its third “Big Cities & Counties Public Works Leaders Forum” in Washington, D.C., last Thursday. The Forum brought together 13 public works leaders from cities and counties from across the United States with populations greater than 500,000 to discuss their respective public works and infrastructure operations. Discussions centered around infrastructure funding, workforce development and training, asset management, and homelessness. The group also heard from U.S. Department of Transportation Senior Advisor in the Office of the Under Secretary of Transportation for Policy Alex Etchen, Federal Emergency Management Agency (FEMA) Deputy Assistant Administrator for Response Joshua Dozor, and Federal Permitting Improvement Steering Council Executive Director Alex Herrgott. In the morning prior to the start of the Forum, the public works leaders met with White House infrastructure policy advisors at the Eisenhower Executive Office Building to hear about the Administration’s outlook on infrastructure, and to share their local perspectives regarding infrastructure needs. “It was an honor to participate in the Forum with such a professional and knowledgeable group. There is much each large city can learn from one another, but also there is much that APWA as a whole can learn from them, and in-turn they from the rest of the membership. 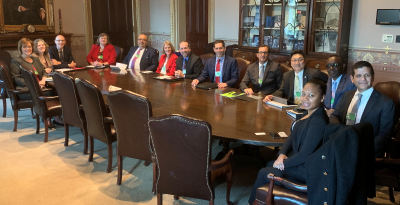 I thank each one of the professionals who took the time and made the effort to travel to D.C. to participate,” says David L. Lawry, P.E., APWA President. “APWA has created a Forum for Public Works Directors from some of America’s largest cities and counties, to discuss best practices and learn from one another. During our discussion, important issues emerged--such as how public works departments deal with homelessness. By working together, we believe we can help all cities throughout the country solve infrastructure funding issues, understand critical needs for a strong asset management plan and develop best practices for dealing with other social issues with which cities are faced on a daily basis,” says Scott D. Grayson, CAE, APWA Executive Director. APWA created the Big Cities & Counties Public Works Leaders Forum to aid in the sharing of best practices from the public works operations of large cities and counties from around the country. The inaugural meeting of the group took place in D.C. in May 2018 during National Public Works Week, when those public works leaders in attendance addressed Congressional Members and staff on the important contributions that public works professionals make every day in designing, operating, building, and maintaining the critical public works infrastructure of the United States. For more information about APWA’s Big Cities & Counties Public Works Leaders Forum, please contact APWA Government Affairs Media Manager Emily Dowsett at edowsett@apwa.net, or (202)701-4554.